GM Jesse Kraii reviews Vassily Smyslov, his favorite player of all time. 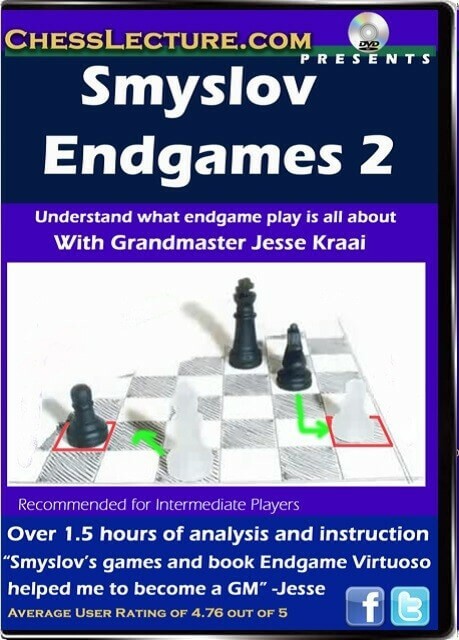 Jesse claims studying Smyslov’s endgames helped him become a Grandmaster.Vasily Vasilyevich Smyslov (Russian March 24, 1921 – 27 March 2010) was a Soviet and Russian Grandmaster and was World Chess Champion from 1957 to 1958. He was a Candidate for the World Chess Championship on eight times (1948, 1950, 1953, 1956, 1959, 1965, 1983, and 1985). Smyslov twice tied for first at the Soviet Championship (1949, 1955), and his total of 17 Chess Olympiad medals won is an all-time record. In five European Team Championships, Smyslov won ten gold medals. Content: Over 1.5 hours of instruction and analysis in a series of 5 lectures. 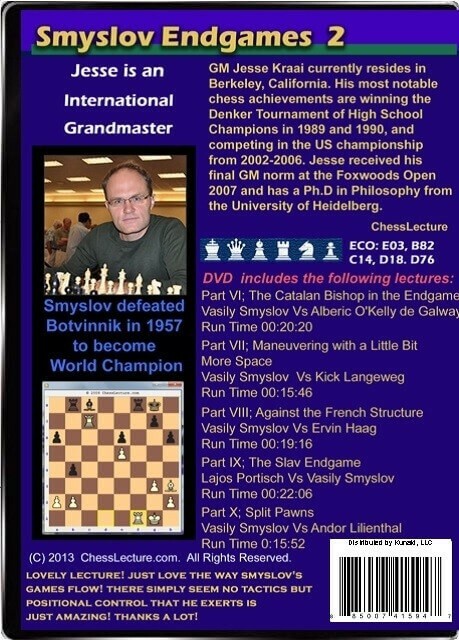 Members of ChessLecture.com rated this series a 4.76 out of 5 Fans on Chesslecture.com said: Lovely lecture! Just love the way Smyslov’s games flow! There seems to be no tactics, just positional control that he exerts. Its just amazing! Thanks! GM Jesse Kraai resides in Berkeley, California. His most notable chess achievements are winning the Denker Tournament of High School Champions in 1989 and 1990, and competing in the US championship from 2002-2006. Jesse received his final GM norm at the Foxwoods Open 2007 and has a Ph.D in Philosophy from the University Heidelberg. Jesse is an active chess coach. Computer Software and DVDs that come on Physical Media (such as CD-ROMs and DVD-ROMS) can only be returned or exchanged if the product is in its original, shrinkwrapped packaging and has not been installed or used in any way. Once you open the packaging of a Computer Software or DVD title, it can only be exchanged for a new copy of the same title and only if the original media is defective. There are NO exceptions to this rule. A DVD player is a device that plays discs produced under both the DVD-Video and DVD-Audio technical standards, two different and incompatible standards. Some DVD players will also play audio CDs. DVD players are connected to a television to watch the DVD content, which could be a movie, a recorded TV show, or other content.